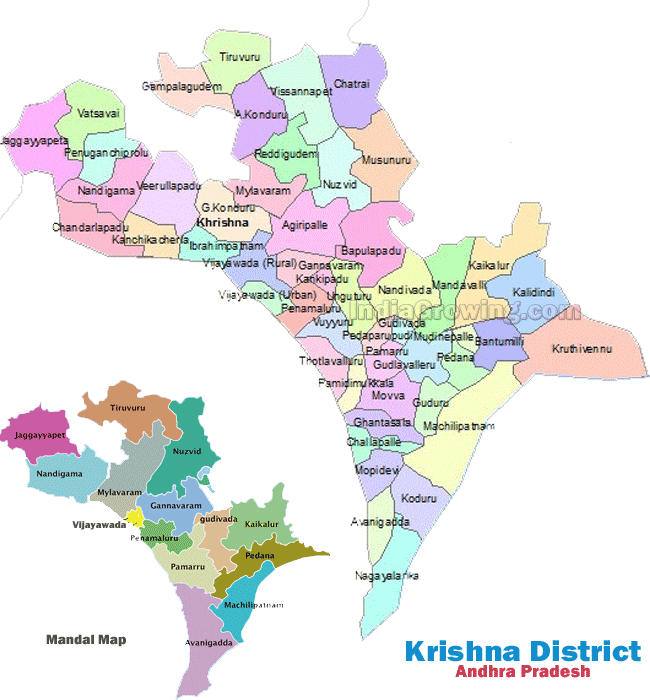 As per census Krishna has a population of 4,517,398 in 2011 out of which 2,267,375 are male and 2,250,023 are female. Expected population of Krishna in 2019 is between 5,014,312 and 5,872,618. Literate people are 3,009,718 out of 1,598,959 are male and 1,410,759 are female. People living in Krishna depend on multiple skills, total workers are 2,048,880 out of which men are 1,327,299 and women are 721,581. Total 140,220 Cultivators are depended on agriculture farming out of 119,724 are cultivated by men and 20,496 are women. 813,137 people works in agricultural land as labor, men are 447,722 and 365,415 are women. The Krishna average altitude (elevation) 5 to 88 meters above sealevel. Village no development.no svachbharath.no transport.nosteet lights.no water land irrigation.total problems in Gottumukkala village. Good Morning . I would like to Bring up the MAZOR Problem that is faced in the Area of A Kondur Mandal is Formers are not able to do forming of Crops OR not able to save Mango Farms due to attack of Groups of 1000 s of MONKEYS .The Total farmer community is in panic and not able to save from them not getting any Income people started cutting of Mango farms I would like to seek a suitable remedy for the above serious problem . 1.Drinking water problem for POOR PEOPLE STAYING IN AMBEDKAR NAGAR,AMBEDKAR COLONY. 2.Not purified PANCHAYATH WATER THROUGH PIPES,especially for sc colonys ambedkar nagar and ambedkar colony. 3.nobody taking any action against development of drainage system for SC colonys,AMBEDKAR NAGAR, AMBEDKAR COLONY. 4. NO WATER PONDS MAINTANENCE LIKE PROPER USAGE OF BLEECHING. 5.MORE ILLEGAL POLITICS,NO DEVELOPMENT,NO PROPER BURRIAL GROUND FOR CHRISTIANS. No medical assistance in the village or nearby. No facility for the waste/garbage collection. No proper roads in the lanes of the village. No drain channels in the village. No public communication phone facility. No plants of Chettu padhakam on the roads. No library in the village. The above are required for the further development of the village people. I am asking my electricity line man to give estimation for my motor on my from last 20-25 days but up to now he didn't not come to check that. my great grand father is from this village and we still hold 1.5 acres land from 80 years we bought it in the year 1936 with all documents with us . wanted to know feature development plans of government and private parties in vellatureu village. Some persons re coming to buy the fields in this village.but that lands re under pulling for the development of Bandar port.government rise red alert of registrations there.how can we proceed to sell a land. THE CONNECTIVITY TO THE VEERULAPADU MANDAL WILL BE SO EASY AND DISTANCE WILL COME DOWN NEARLY 12 KMS TO MANY VILLEGES OF MANDAL IF THE ROAD ON NSP CANAL INSPECTION PATH WAY DEVELOPED AS ROAD FRO NH-9 UMA HOLIDAY INN DONABANDA USUALLY CALLED AS QUARY ROAD. IF IT HAPPENS ALL MOST MANDAL WILL COMES NEARER TO VIJAYAWADA WHICH CAUSES ECONOMICAL GROWTH. CONSEQUENTLY ALL THE CONNECTING ROADS FROM KANCHIKACHERLA - MADHIRA ROAD TO NSP BUND IN THIS MANDAL SHOULD WELL BUILT. we do not having water reservoir (pool). it is very difficult to servive in summer. transport facility also very poor. request you pl take action on this.